Mexican Rain Cape Thatch Features: Versatile product; can be cut using scissors, like cutting a fish net. 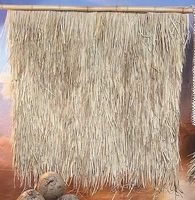 Specifications of Mexican Rain Cape Thatch: Hand-woven palm leaf sheet is for 48" W x 48" H x 1" thick and weigh 9 lbs each panel. Is Mexican Rain Cape thatch waterproof? No; Mexican Rain Cap thatch panels are purely for shade cover and to create a tropical feel for your product. For a waterproof structure multiple layers would be needed.